Paul’s view of accreditation seems backwards to us (and apparently to some in Corinth). From Paul’s perspective, his ministry is validated not by outward glory but by afflictions. While Paul says much about glory in 2 Corinthians, he makes it clear that the glory in the earthly life of the believer is hidden inside and will not be fully experienced until (to use Paul’s metaphor) “the earthly tent which is our house is torn down” (2 Cor. 5:1). In the context of 2 Cor. 4-5, it becomes quite clear that Paul is referring to his earthly body with the phrase ‘earthen vessel’ (easily broken, temporary, essentially worthless, etc.). But this worthless vessel contains something of exceedingly great value. So what is the treasure inside the vessel? Just before v.7, Paul speaks of “the One who has shone in our hearts to give the light of the knowledge of the glory of God…” (2 Cor. 4:6). Further back in the context Paul refers to “the light of the gospel of the glory of Christ” (2 Cor. 4:4). 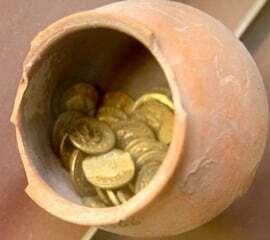 Thus Paul sees himself as an essentially worthless vessel which carries the Gospel, an exceedingly glorious treasure. In His wisdom, God saw fit to use temporary worthless vessels to carry a glorious, life-giving message. So what is kind of life does such a ‘vessel’ live? Give 2 Cor. 4:8-12 a read! Paul sees his own afflictions as part of the deal; it’s the nature of being a clay jar. But his motivation lies in what’s inside. For it is the Gospel, the treasure which ironically provokes affliction when shared, that promises life. It is through the Gospel that Paul anticipates a future “building from God…eternal in the heavens” when “the earthly tent…is torn down” (2 Cor 5:1). This is what I call the true prosperity Gospel! Thanks Josh. And great photo. There is a vessel like this in the University of Chicago museum as well if you ever make it up there (Oriental Institute). It illustrates well what Paul is saying. We have the currency of heaven — the gospel — and the exchange rate is our lives. We embody the message so that we are more than just messengers, but the capital expenditure is alive in us. Which means that we can’t say, “I am just the messenger”, for so goes it for the message, so goes it for the messenger. When they reject our praise of Jesus, they add to it the rejecting of the one who testifies. I wonder if fallen humanity could get their hands on Jesus, if they’d do anything other than crucify him again. Well, of course they can’t, so we’ll have to do; we fill up the sufferings of Christ that are outstanding in their hatred of him. We carry about this message as we are afflicted and used up for the sake of the Gospel! Could it be better?! No way! It is fantastic that God has used these clay containers to contain the message. I have lost more friends because of the Gospel than I had imagined possible. It is the way of the cross. Jesus said they hated him and they’ll hate us too. We have a treasure of great value, that we carry at a cost. We lose our lives, but we gain them back in the resurrection. The Gospel is radical message, but a refreshing (literally!) one.